It takes great pride and honour to introduce to this world a renowned spiritual legend- the most prominent peace leader from India – His Holiness Dr. VasanthVijayji Maharaj, the living legend of “Ahimsa”. His Holiness is adored and followed by millions and have been instrumental in moving numerous followers with his universal message of harmony, unity and brotherly love for reconciliation and peace between families, citizens and nations. His vision is to offer all children, youth and every individual of the world the opportunity to be educated by the means of peace and non-violence and create a blissful globe with a message of peace and prosperity for all Mankind’ – A World in which each one is loved and respected by each other despite the differences in culture, religion and lifestyles. His Holiness is the first Indian Jain saint to be appointed as the Ambassador of Peace by the United Nations and the Diplomatic Consular from India by the International Parliament of Safety and Peace (UN body). His Holiness holds 9 Guinness world records and 5 Limca world records for his Commendable Non-Violent movement for over 25 years. Besides being the winner of the Public Peace Prize for 2015 and a nominee for the Nobel Peace Prize in 2011, his Holiness is the champion of Peace like great leaders of the past Nelson Mandela, Mother Teresa and Mahatma Gandhi. His Holiness had been invited to the US from April 7 to July 7, 2016 to spread the Universal Message of Peace, love and harmony. His grand welcome on the soil of United States was done in Columbus, Ohio with the presentation of Mayor's Proclamation and the announcement of recognising him as the Honorary Citizen of Ohio on April 7, 2016. He did travel to several states in the US taking His Peace Mission across the United States and teaching the common public as well as meeting political and official dignitaries in different states. His Holiness had organized a ‘Biggest Ever Charity Event in the History of Food Distribution in India for the Poor and Needy’ on May 31st 2015. This largest Serving of Rice Pudding and Huge Display of Fruits that depicted the word ‘Peace’ in different languages was truly spectacular and this was consumed and distributed to the Poor and Needy communities throughout the country. This Event was recorded in the books of Guinness World Records as well as witnessed a record participation including affluent dignitaries, peace leaders, celebrities, people from government, press, media and the common public with representation from the Poor and needy communities throughout India. The aim of this Peace event was to create awareness among the mass population and send the message across the Globe on the importance of Peace and living in harmony by spreading sweetness and happiness which was depicted in the Sweet Dish (Rice Pudding) and in the Fruit Display (Word ‘Peace’) . His Holiness launched “Peace Education as compulsory subject in school curriculum” which gained tremendous momentum and response throughout the World. He travelled all around the World and have met several famous dignitaries including the Pope of Vatican, Presidents, Prime Ministers and Heads of different countries in this respect. He has drafted the five point agenda on peace education explaining the role of different sections of the society-“ 1.Role of Policy Makers, 2. Role of Principals, 3. Role of Teachers, 4.Role of Parents and finally the 5.Role of Children. His Holiness has promoted larger peace by organizing different kinds of peace activities with new ideas and innovations. Some of the divine works include peace march, peace fasting, peace promoting competitions, lectures, workshops, environmental peace seminars, non-violent activities, animal welfare, food habits, spiritual practices including meditation/yoga/havans, working for children and needy, construction of peace centers, schools and hospitals, providing basic rights for under privileged societies and the list goes on. His Holiness has evoked the path of peace in many across the globe by his dedicated and concentrated meditation. His Holiness has been practicing meditation over years now with minimal diet as his appetite. The most prolific achievement of his Holiness was observing 850 days of continuous silence in the recent years. 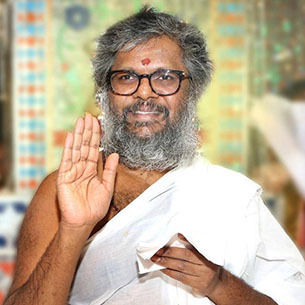 It is hugely reassuring that while the world goes about its business, there is somebody like Dr. Vasanth Gurudevji Maharaj constantly worrying about its wellness. Our respectful Salutation in His Holy Feet.